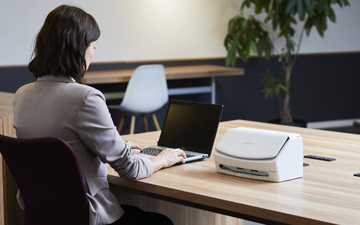 TORONTO, November 7, 2018 – Canadian accountants and bookkeepers have helped to make the Fujitsu ScanSnap the number one personal document scanner in Canada. Now, with the launch of the new ScanSnap iX1500, ScanSnap’s pride of place in public accounting firms looks assured. The most noticeable new element (beyond the sleek, white design) of the latest model in the ScanSnap series is the touch screen tucked underneath its top. The 4.3-inch screen has an enhanced user interface with simple icons that allow easy access to custom profiles. In addition to connecting to ScanSnap Cloud, which links with a variety of document management cloud services, the iX1500 automatically names and suggests titles for scanned files. Fujitsu ScanSnap iX1500 with touch screen technology (photo credit: FUJITSU). How did the ScanSnap secure the premier place in public practice across Canada? According to Steve Oblin, senior marketing manager of Fujitsu’s Imaging Group, it began with engineering. “Especially in the early days, Fujitsu became very well-known for incredibly reliable technology, which gave us a strong reputation in the marketplace,” Oblin told Canadian Accountant. The second reason is end-user feedback from the accounting and bookkeeping professions. “We spent a lot of time speaking with users and getting their feedback. We do a lot of activities with the accounting communities.” Fujitsu is a regular presence at accounting and bookkeeping conferences across North America and has strong relationships with document management companies. The ScanSnap series supports the business operations of accountants and bookkeepers from sole practitioners working in home offices to the vast operations of the Big Four. Oblin says one large public accounting firm has 5,000 ScanSnaps throughout its offices. The machine scans a multitude of documents from business cards, receipts and envelopes to larger documents, and automatically readjusts for paper size with every scan. 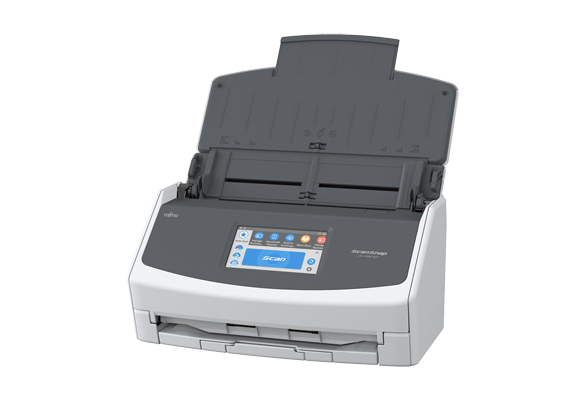 The iX1500 has up to 30 profiles on its display that can be moved, edited or deleted to match various tasks. Most users, however, typically choose the auto-scan feature, which automatically crops, removes blank pages, detects colour or black-and-white, prints double-sided and “de-skews” (straightens crooked images). ScanSnap Cloud currently supports the three Fujitsu scanner models with built-in Wi-Fi: the iX100, iX500 and iX1500. (Some practitioners will take the scanner with them and use their phone as a hotspot.) Its many cloud integrations include Dropbox, Google Drive, Hubdoc, LedgerDocs, and QuickBooks Online. Oblin explains that previous generations of the ScanSnap came with several software applications, such as ScanSnap Organizer, Cardminder, and Receipt. With the iX1500, all applications have been combined as ScanSnap Home. Users can insert multiple documents of various sizes and the software will identify and categorize them automatically. It’s a convenient feature for, say, a sole practitioner working out of his or her home office. Oblin says that, although the ScanSnap is typically used in a professional environment, it’s very much a personal scanner. “It is your scanner sitting on your desk beside your computer,” he explains. “It’s not a network scanner that will be shared by 10 or 20 users.” He agrees that it would not be unusual to walk into a large-market public accounting firm and spot a ScanSnap. “Either sitting on their desks or in many cases there’s a pool of ScanSnaps for when their financial auditors go to customer sites." 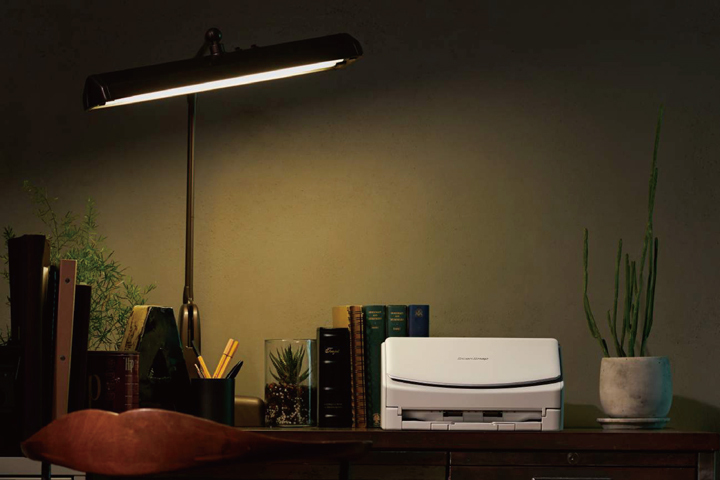 Fujitsu ScanSnap iX1500 in a home office setting (photo credit: FUJITSU). Colin Ellis is the managing editor of Canadian Accountant.